I am currently – with colleagues Mikael Lönnborg and Gerhard Schjelderup – editing what we hope to be a book of Scandinavian teaching cases. In a meeting in Stockholm recently, I was asked to explain what it takes to write a teaching case. I gave my opinion, we had a very interesting discussion. Here is my (very rough and off the cuff) opinion about what it takes (in reality, how a teaching case differs from a research case). Why are you writing this case? 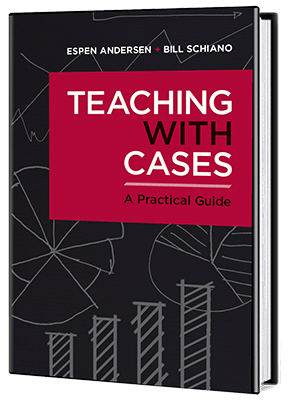 Cases are written for a teaching purpose – and to write a teaching case, you need to have a teaching objective in mind. It is not enough to have an interesting company. Even the best company story needs to have a pedagogical point, a theory or dilemma to illustrate. So don’t write a teaching case just because you happen to know someone in a really interesting company – it does need to be a good story, but it also need to have a purpose. 0.5 page: Intro: The protagonist is introduced, typically pondering a question of some importance. The idea is to tell the students from which perspective the case is written, to set the scene – and that is all there is to it. 1 – 1.5 pages: Description of the company – not the whole history, but the relevant details, explaining what the company is doing, how they make their money. Most companies are to a very large degree formed by their history, so the relevant parts need to be told. 1 page: Industry. Companies exist within a context, and you need to set it. Explain the industry, its evolution, and the company’s position within it. Do it succinctly, but leave more detail in than what is strictly necessary. 1 – 5 pages: Specific issue. This is the meat of the case, the issue at hand, the story to ponder. Make sure you tell it logically and cooly, not leaving anything out, but also conveying the complexity of the situation. 0.5 page: Conclusion, typically with the protagonist wondering what to do, often with some sort of event (board meeting, etc.) where he or she has to present a solution to the problem. Most cases are just that – one case. You can have a B case and even a C case, but keep them short, since they have to be handed out and read in class. The B case should explain what the company did and perhaps introduce a new problem, the C case, if necessary, should bring some sort of closure, explaining what eventually happened. In my experience, it is very hard to get discussion after a C case – the students become exhausted. As a novice case writer, especially if you are writing about a company with a long history, it can be tempting to create a long string of small cases, but in practice this seldom works well – for one thing, it forces the discussion into a very predictable path. A good case should be a description of an interesting situation, frequently a decision point – and nothing else. This means that there should be no theory and no discussion of the case in the case itself. Save that for the teaching note, or write a separate academic article about it. Not only does this make the case more realistic, it also means it can be used for more purposes than the one initially envisioned. This can be quite challenging for the traditional academic writer – but ist is actually good practice to only present the facts (though, of course, which facts you choose to present constitute a discussion of sorts). When teaching students how to analyze a case, I always start by saying that for most business situations, if is useful to begin the analysis with the assumption that people are not stupid and not evil. Consequently, when you write a case, make sure it has no heroes and no villains. If a case has a clear-cut hero or villain, it is a sign that you have not done enough research. Write things so that the students can see the issue from many perspectives. A really well written case has dramatic structure – there is a beginning, a middle that builds up the story, and a really compelling issue at the end. The best cases are almost like a detective story, where you have to dig deep into the analysis to find surprising and sometimes counter-intuitive conclusions. One example of a “detective story” case is Fabritek 1992*, a very old (first published 1969, rewritten by Jan Hammond) case about a quality control issue in a small mechanical workshop. (Hat tip to Robert D. Austin, eminent case teacher, for making me aware of this case and showing me how to teach it.) The case is excellent because it starts with the company (strategic level), proceeds to describe a new situation and a new process (organizational or business logic level) and then introduces the problem (operational level.) Analyzing the operational details leads to one conclusions, which can then be discussed in terms the organization and its business logic, which can then be placed into a strategic context. The case is excellent because it allows links between these levels – and also teaches the students that the devil indeed resides in the details, and that you as a manager better be very close to how the business you are leading works and makes money. 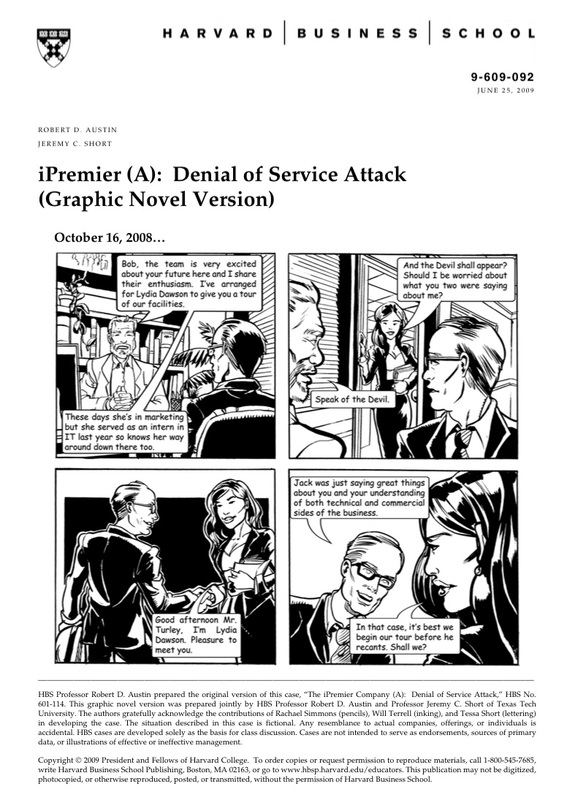 A second case which shows quality and innovation is iPremier, written by Robert D. Austin and Jeremy C. Short, the first and only graphic novel (cartoon) case I am aware of. The story is about a small online gift company being attacked by hackers, exposing glaring gaps in their security procedures and forcing managers at various levels to make some really hard decisions. The graphic format is excellent in making the various characters real (though they, on average, tend to be way too good-looking for a normal business situation), illustrates technical issues in a way that is very understandable even by non-technology students, and has a cracking good storyline with a B and a C case. I like to introduce a few technical cases in my courses because, well, I don’t think there is enough technology in business schools, and this cases answers very well because it illustrates that certain technical decisions very much require top management attention – ignore (or mindlessly delegate) technology understanding and responsibility at your peril. The graphic format also provides a welcome break from the standard case verbiage, which can be a trifle dour on occasion. Doing it – and reading about it. Last but definitely not least: Don’t underestimate how much work writing a proper business case is. Getting the details right, describing the dramatis personae, and making the storyline compelling is quite a challenge, in many dimensions different from the traditional academic article. On the other hand, should you get it right, you will have a very effective teaching tool for many years to come. This entry was posted in Academically speaking, Case teaching on December 8, 2014 by Espen. Esben, Thanks a lot. This is brilliant and just what I needed. I am one of you students from “Case Method Teaching Seminar” part I held in Paris. This spring I will be joining part II in Boston. I am still using the teaching method a lot and are now also developing some “writing teaching cases skills”. I find it very interesting work – but also quite challenging especially in relation to academic writing as you adress it.